In this week’s parashah we read about the “baby wars” between Leah and Rachel as each try to outdo each other in giving their shared husband sons. It’s easy to dismiss as a misogynistic satire of two women fighting for their husband’s attention, but that’s only the top layer of this fascinating story. A closer look offers deeper insights. Consider: Jacob was a follower of his father’s and grandfather’s G-d. But what was the focus of Rachel’s and Leah’s reverence? Note Leah’s words upon the birth of her second son. She exclaims b’oshri! which has been explained as a form of ashrey, “joy”. Leah names her son Asher (Gen. 30.13), and some scholars see a note of thanks to the Goddess Asherah in both the exclamation and the name. Leah and Rachel name their children when they are born. (So does Eve.) When the world is created, G-d brings all the animals to Adam, and he names them. The power of naming is akin to the power of creating; to name something is to bring it fully into existence. When it comes to new human beings, the power of their names in is the mouths of their mothers. What other powers did our Matriarchs wield, of which no hint has remained in the final redaction of our Torah text? And what else is buried in our Torah text, between the lines, half-hidden, covered over by later re-shapings of meaning and context? My teacher, Dr. Byron Sherwin, taught me that everything a feminist needs to argue against Jewish patriarchy is already there in our ancient sources. One need only know how to look. So let’s look at words and their power in Judaism. As the Psalmist has noted, clumsy human language is not suited to G-d’s praise; yet we, described in Jewish medieval philosophy as “the creature that speaks,” keep trying to name our sense of kedushah, holiness, and its Source. By definition, the One G-d is not defined by borders, by tribal ethnicity, by age or politics or nature; the irony of arrogating kedushah to an exclusive group is that it empties the term of meaning. Here the case of gender is enlightening. As feminist theologians have pointed out, naming G-d “he” at the expense of the use of the word “she” defines G-d as less than All: and this is the basic definition of idolatry, i.e. revering something less than G-d as G-d. Restriction of kedushah by gender, or by any other means, is not a religious statement; rather, it is an example in antiquity as in modernity of a social expression, or even political use, of the concept of the holiness of G-d. Such definition suits limited purposes. To the extent that feminism stands as a corrective to patriarchy, and leads us toward the equal cherishing of all aspects of creation, it re-captures an ancient cultural weighting of the feminine. Life brings change; cultural perspectives come and go; each time, we must bring careful thinking about texts we respect and so expect to contain more than meets the eye. Each new challenge, met thoughtfully, can help us find a new balance between opposites that need each other to exist at all. Only the embrace of opposites brings one closer to the One Source of All Being. This entry was tagged Dr Byron Sherwin, feminism, Genesis, kedushah, Matriarchs, naming, parashat hashavua, Rachel and Leah, VaYetze. Bookmark the permalink. Wonderful, Reb Ariel. I really appreciate your words of Torah! 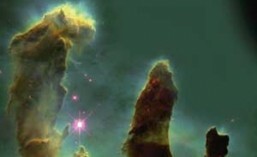 BTW, what’s the picture on your Torah in the 21st Century, nebulae? Thanks for your kind words, Yehudah. The photograph is a Hubble telescope image of the Eagle Nebulae, which looks uncannily like the Hebrew letter shin.